The Inn at Entrada is a small boutique resort offering 46 private casitas encompassing the exclusivity of a private club atmosphere. 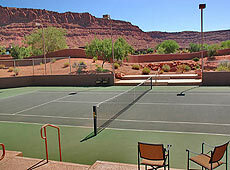 Guests at the Inn have access to the world-class Johnny Miller designed Entrada at Snow Canyon Country Club, as well as the tennis courts, sports and fitness center, pickleball courts, sand volleyball, outdoor basketball, plus spacious and relaxing indoor and outdoor pool areas. Southern Utah's sunny, dry climate makes for an ideal spot for outdoor recreation, and the town of St George creates a magnetic energy for those people seeking a better life style, blending modern sensibilities with a pioneering spirit. 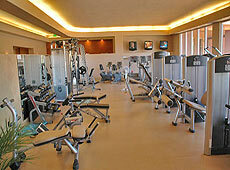 Only members and guests of the Inn are entitled to use the facilities, including golf. 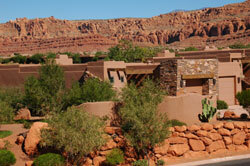 For information about amenities and reservations at the Inn at Entrada, call the phone number listed above or log on using the weblink provided near the top of this page. Entrada at Snow Canyon is a PRIVATE Country Club featuring a spectacular 18-hole Johnny Miller, Troon Golf Championship design, a 22,000 square-foot William Zmistowski-designed clubhouse, target grass range, spacious putting green plus short game area. The wonderfully appointed clubhouse features a full-service restaurant, lounge, banquet facilities, golf shop plus private member's locker rooms. The golf course stretches across acres of unique desert landscape against a backdrop of sandstone cliffs, rolling dunes, ancient lava fields and rugged arroyos. 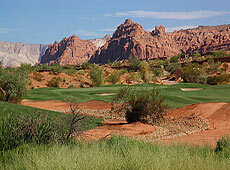 It is an incredible design, with a great variety of golf holes and gorgeous red rock scenery. Stay at the Inn to enjoy this fabulous courss...and also enjoy the variety of several other top courses in the St George area. This is an ideal spot for a golf or family vacation! Keep in mind that the once "open for public play" Entrada Course is now reserved for members and guests only! 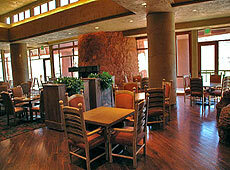 For a pictorial review of Entrada at Snow Canyon Golf Club click here. 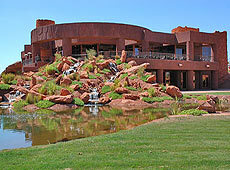 After a day of golf, hiking, biking at the adjacent Snow Canyon state Park, or simply relaxing at the pool - guests will enjoy the amenities of elegantly appointed villas which include leather furniture, a fireplace, a jacuzzi tub, indigenous natural stone exteriors, water features and professional landscaping which reflect the ancient Anasazi culture. One, two and three bedroom units are configured to suite the needs and desires of visiting guests. 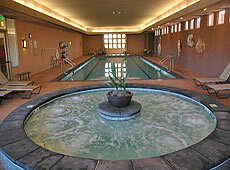 Pampering and service of a luxury resort complete the relaxing getaway that awaits every visitor who stays at the Inn at Entrada. 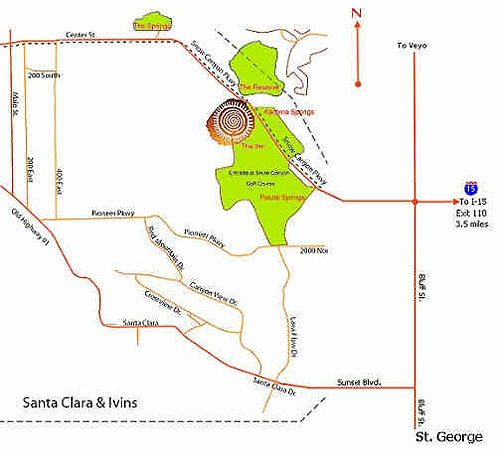 In addition, nearby are 4 lakes available for swimming or fishing, great shopping and dining, plus hiking and biking trails. St George is home to concerts, art museums, play and cultural events. Zion and Bryce Canyon National Parks are short distances away, as are many other famous and lesser known state parks. DINING is available at the Kokopelli Grill which features chef's delight dinners with an eclectic and constantly changing menu. 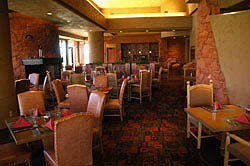 Breakfast, lunch and dinner are served at the clubhouse restaurant. The surrounding views perfectly capture the rich hues and beauty of the high desert.